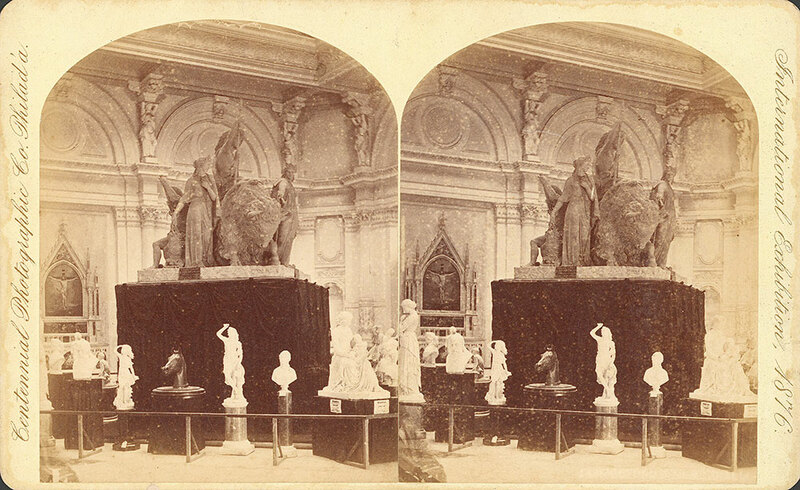 Notes: 1 stereograph; 11 x 18 cm. Notes: Collection of small sculptures around the base of a larger sculpture. Notes: Exhibit titles: "Thetis thinking how she may regain the birthright of her son Achilles" - P.F. Connelly, Exhibit #1190; "Horse's head" - P.F. Connelly, Exhibit #1187; "America" - John Bell, Exhibit #3a, Exhibited by H. Doulton & Co., Great Britain, Memorial Hall/Art Gallery, Gallery B, Bldg. #101. Notes: Title supplied by cataloger.